It feels like it's been forever since I did an update about what we have been up to here in Yellowstone. We've done so much in the past few weeks. 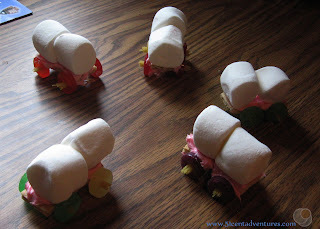 I've hardly had any time to sit down and create a blog post. As it is, I still don't have much time, but I'm going to try to squeeze out a post right now. I promise to write more in-depth posts about Yellowstone after we are done here when I have access to better internet again. Somehow most of the things we did in July all had to do with water. 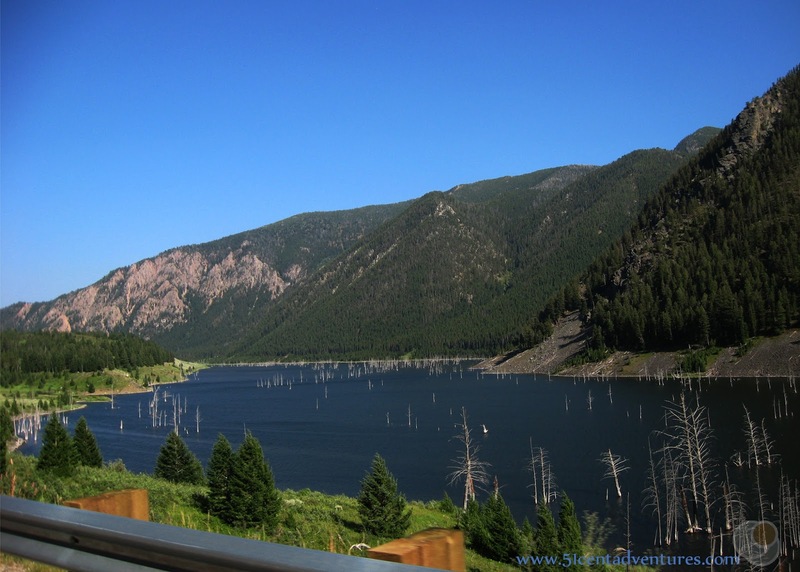 First up is the hike we went on the day after we hiked Mt Washburn. You'd think we would be sick of hiking, but no we decided this would be a good day to see the suspension bridge that crosses the Yellowstone River in the north part of the park. The hike to the bridge was "only" a mile. 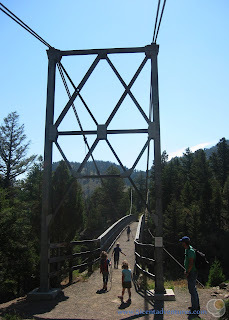 But since this was only a day after our big 7 mile hike the kids weren't exactly thrilled to be walking a long distance. Plus we'd been lazy and gotten a late start that day. So by the time we reached the bridge none of us were in good moods. Everyone was kind of like, "this is it?" In retrospect it was a pretty cool bridge. I just don't recommend this hike as a follow up to Mt Washburn. 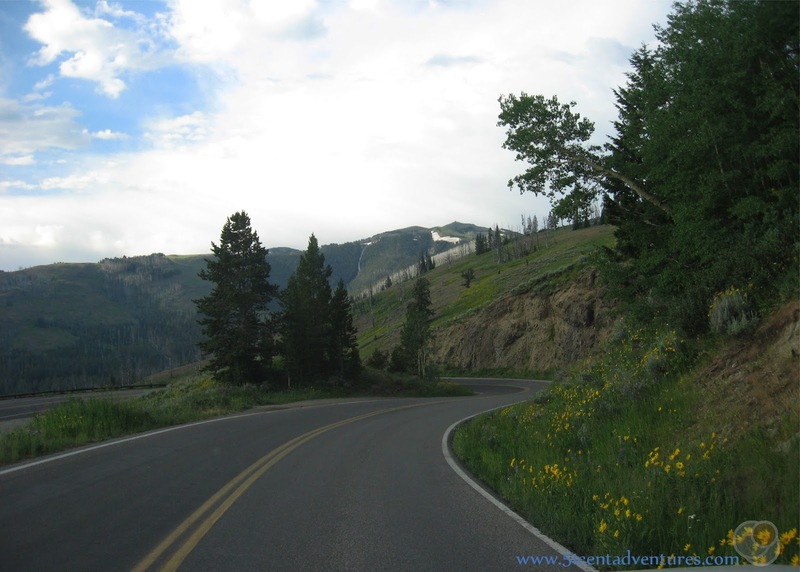 When we got back to the car we drove out of the park and into a National Forest area north of Gardner Montana. 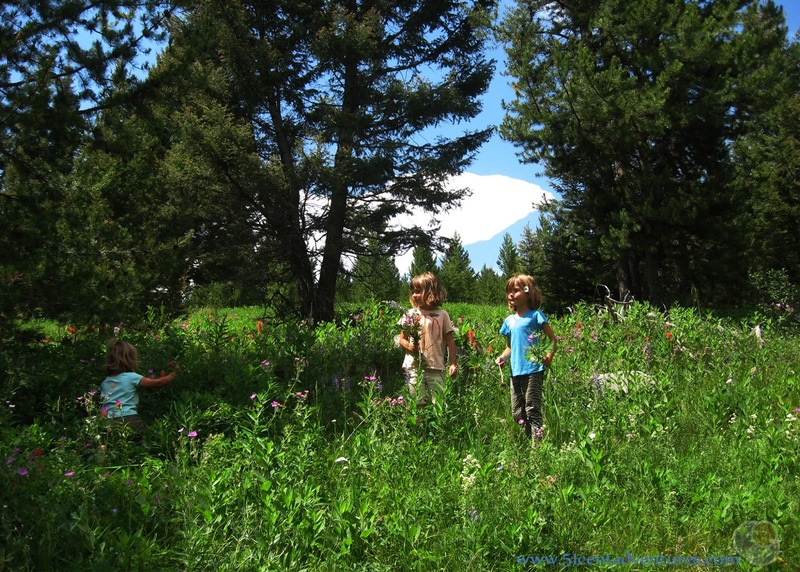 My supervisor had told me about a place that she went to pick wildflowers and I knew that was somewhere my daughter would enjoy. She's always talking about how she wants to stand in a field of flowers and pick as many as she wants. So we brought a bucket of water and picked many wild flowers. This wasn't quite as dreamy as it looks or sounds though. That's because there were bugs everywhere. And they were vicious. A horse fly bit me so bad that I started to bleed. The kids were all hysterical by the time we left. So far this day had felt pretty hit and miss. So I was hoping our final activity would be a home run. I'd read about a swimming place called Boiling River. Boiling River itself is run off from a hot spring near Mammoth Hot Springs. It's not boiling, but it is too hot to swim in. 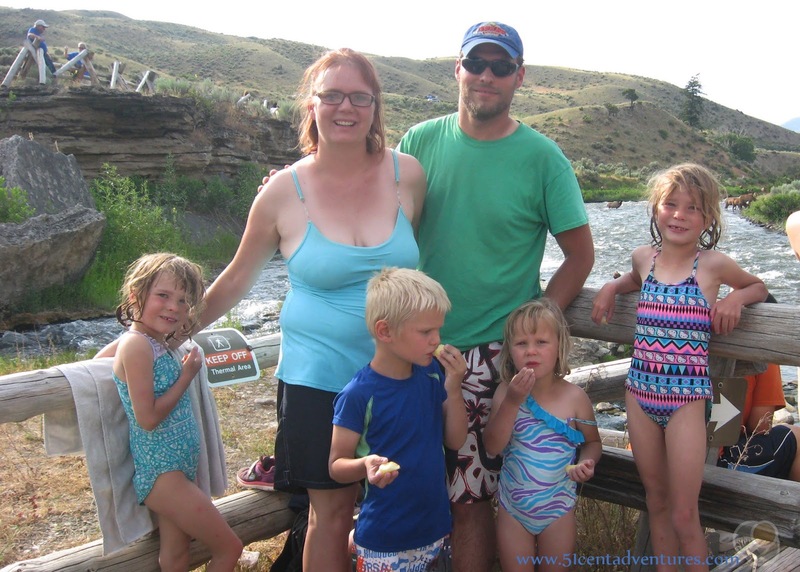 However, the area where Boiling River meets the Gardner River is a nice place to swim. We went there to check it out. And it was great! I was surprised by how HOT the run off water was and how COLD the river water was. One side of my body was cooking while the other was freezing. But I was able to find a good balance and enjoyed soaking in the water. We all had a great time. After a busy weekend I was glad to get back to work so I could rest. I started my new position which meant longer days. I love my new job, but the one draw back is that I don't really feel like going on adventures when I get home from work. (But the three day weekend makes up for that.) However one night I did feel like going somewhere. I took two of my kids to Artist Paint Pots. We sat by one paint pot for over half and hour and watched it spurt out mud. We had a lot of fun with that. 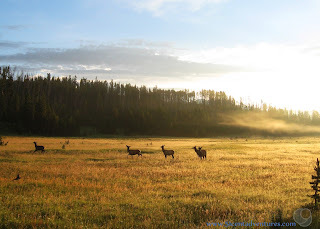 The first time I visited Yellowstone I came with my family when I was 17. If you ask my mom about that trip she will tell you how all we did was drive on skinny two lane roads along the sides of mountains. That basically sums up my commute to and from work. I go through the Dunraven Pass on Mount Washburn every day. It's pretty awesome. One day my family met me after work and we checked three waterfalls off our bucket list in one evening. 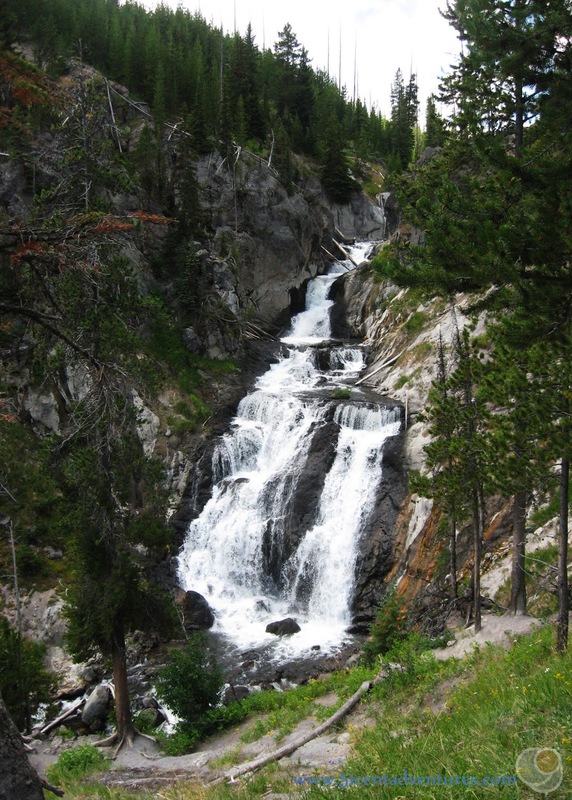 The first was Lost Creek Falls behind Roosevelt Lodge. You can't get very close to that water fall and so I don't have a great picture. The second was Undine Falls which is just off the northern part of the Grand Loop Road. This is probably the prettiest waterfall that you can see from the side of the road. The third waterfall was Wraith Falls which is half a mile from the main road. The waterfall itself was okay, but my favorite part of the hike was these jungle girls that we encountered. On one of my days off we went to West Yellowstone to meet up with one of my friends. When we were done with our visit I didn't want to go back into the park yet. 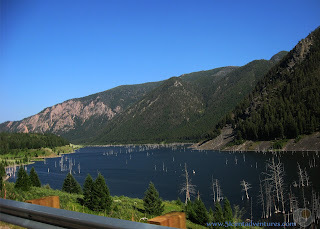 So we went a little bit north to check out Quake Lake. This is the sight of a terrible disaster back in the 1950's. There was an earthquake near here. The earthquake caused a landslide that blocked the flow of the Madison river. At the same time as the landslide, water went sloshing over the dam of a lake upstream. The wave of water crashed through the canyon where over over 200 campers slept. It was a night of terror for everyone as they struggled to reach high ground and assess the situation. In the aftermath of the disaster people were rescued and roads were repaired. The US Army corps of engineers assessed the landslide and decided the best thing to do was to dig a spillway for the water. The water flows over the landslide, but much of it stays behind the landslide forming a lake. This is known as Quake Lake. Today you can still see the tops of trees sticking out of the water..
Then we went to Virginia City which is basically a mining town that converted to tourism as a way to avoid becoming a ghost town. The next day I had a whole list of things I wanted to see inside the park. I wanted to hike to Fairy Falls, then hike to Mystic Falls, then go to Old Faithful for a solar viewing demonstration, then hike to the observation point overlooking Old Faithful, and finally go swim in the Firehole River. I made all these plans before I actually looked at a map. I realized that the hike to Fairy Falls would be quite a bit farther than I anticipated. But I figured since the trail was level it wouldn't be that bad. We ended up spending the whole day just on the Fairy Falls trail - or rather a trail that led to the Fairy Falls Trail. 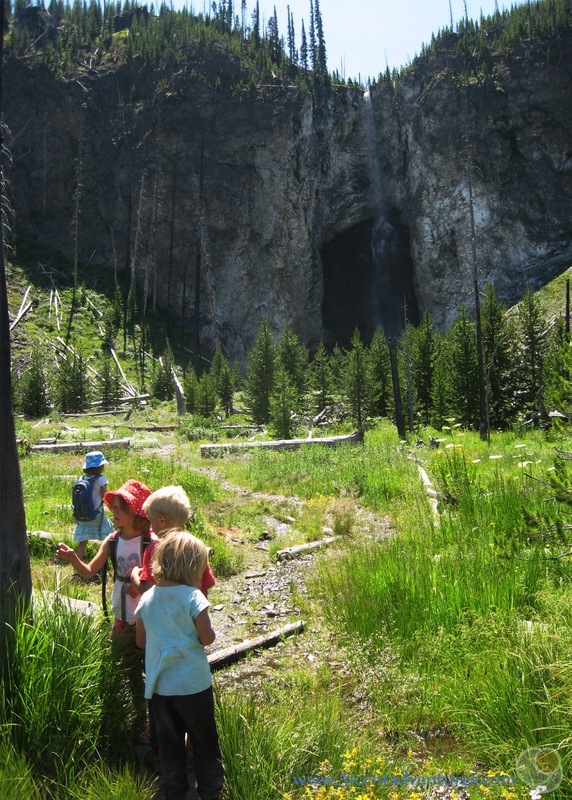 The real Fairy Falls trail was closed during the early part of the summer. I just assumed it was still closed and so we decided to take the longer route to Fairy Falls on the Fountain Flats drive trail. In retrospect we probably should have taken a 5 minute drive down the main road to verify that the Fairy Falls trail was still closed. But we didn't think to do that. So we optimistically set out on the Fountain Flats Drive trail. It would be 3 miles before we even met up with the Fairy Falls trail. As predicted the trail was flat and it wasn't a bad hike. We'd set out early enough in the day that it wasn't hot. But there were a few things that made the hike difficult. Biting moths being the main things. I didn't even know moths could bit. But these things bit with a vengeance. They even bit through our clothes. The kids were crying, but we'd come so far that turning back wasn't an option. 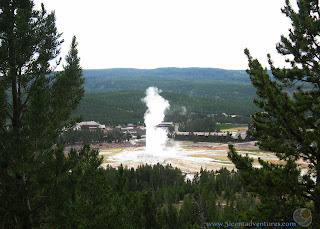 Our map and guidebook both listed Imperial Geyser as an interesting side trip from Fairy Falls. I just wanted to get to the falls, but my husband wanted to take the side trip. So we followed a trail to the west and soon arrived at a small geyser spurting out water. I wasn't impressed by the geyser and wished we had skipped it. But my husband noticed a run off channel that seemed to be coming from farther up the trail. So he went up the trail to investigate. He came back grinning and said that the real Imperial Geyser was located 100 meters up the trail. 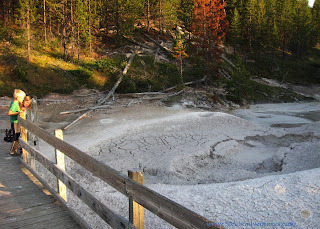 So we went up there and were greeted by the best kept secret in Yellowstone. Imperial Geyser is a fountain geyser that erupts about 10 feet in the air for about 5 minutes at a time. There's only about a minute between eruptions. 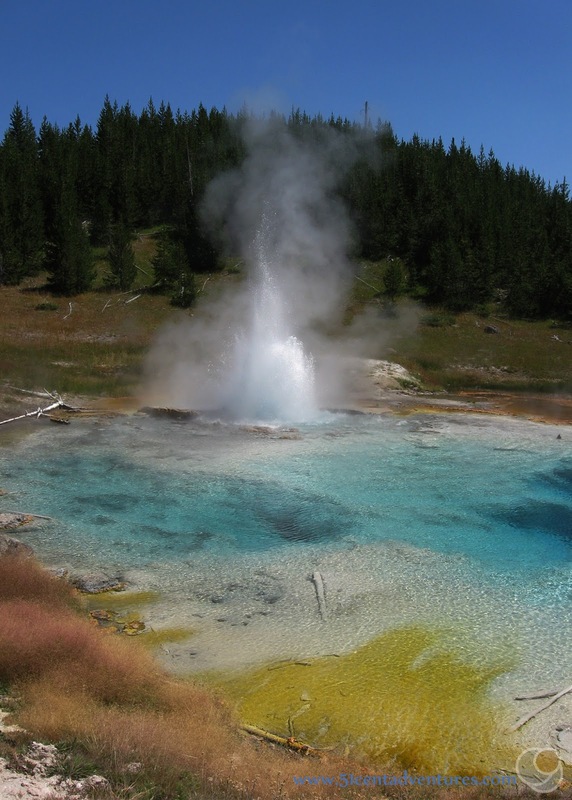 In addition to being a beautiful and consistent geyser it is surrounded by a gorgeous pool of water that is brilliantly blue. We ate our lunch while enjoying the stunning site. This was definitely worth the hike. Then it was time to continue on to Fairy Falls. We'd been able to see the ridge with the falls during the whole hike. At first we could just see a dark impression where the falls were. 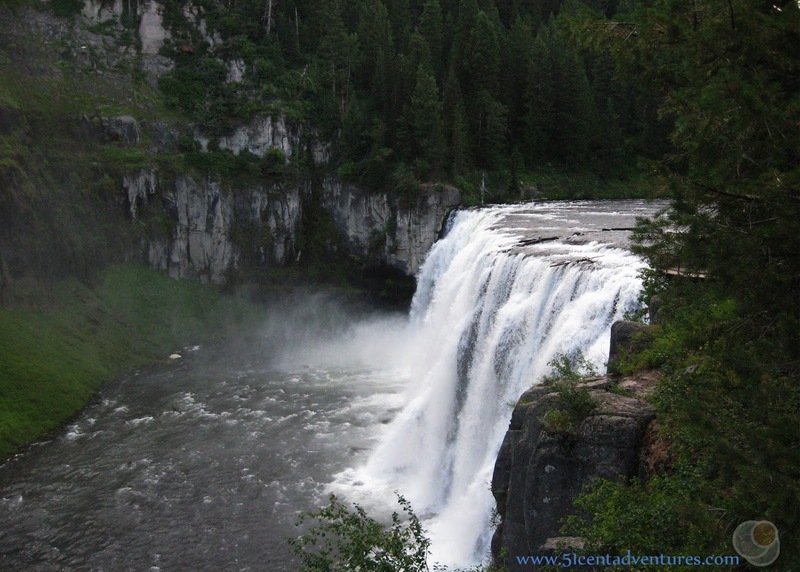 But gradually we could make out the falls, and later we could even see the water flowing through thin waterfall. Finally we were close enough to hear the water falling. 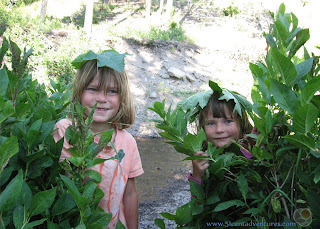 We went up close to the falls and found a shady area with a small pool. Some hikers were brave enough to get into the cold water. We were content to stand on the side and enjoy the cool air. We took a different way back to Fountain Flats Drive and noticed a lot more hikers than we'd seen all day. I began to suspect that maybe the real Fairy Falls Trail was open after all. And if it was open it meant that something else that had been closed might be open. 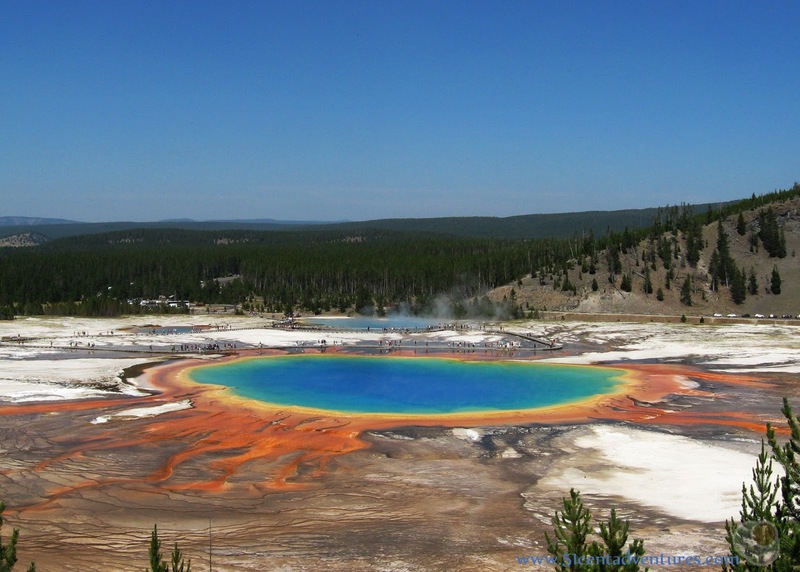 One reason the Fairy Falls trail had been closed earlier this summer was because the park service was building an observation area on the hill that overlooks the Grand Prismatic Springs. For years people have climbed this hill in order to get a good look at the largest spring in the park. None of the trails were official and quite a bit of erosion was occurring. Finally they decided to just put in an official trail and observation point. This trail led off of the Real Fairy Falls trail. So when we reached the Fountain Flats drive we didn't start the 3 mile hike back to the car. 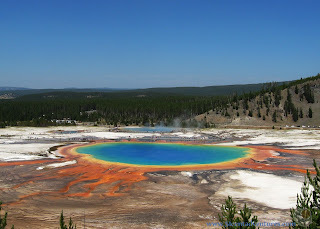 Instead we turned toward the hill above Grand Prismatic Spring. We could see people on the observation platform and soon we found the trail to the top. The view was definitely worth the short hike up there. We could tell that the official Fairy Falls trail was open and so we made an important choice. 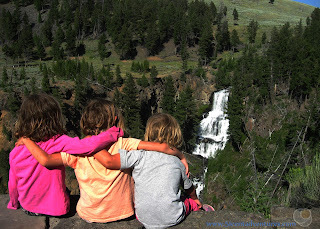 I decided to take the kids down the mile or so to the real Fairy Falls trail head. My husband would hike back the 3 1/2 miles to our car which was parked at the Fountain Flats trail head. Then he would drive the car to pick us up. I'm so glad we decided to do that. As it was we ended up waiting for over an hour for him to come pick us up. I have no idea how long it would have taken us to hike back to the car with four tired kids in tow. By this time it was after 5:00 and we were wiped out! All our other plans for this day would have to wait until other days. Once again I was pretty happy to go back to work so I could have a chance to rest from our crazy weekend. On July 24th we celebrated Pioneer Day by making covered wagons out of graham crackers, marshmallows, and lifesavers. The kids through this was great. The next weekend was spent on a different sort of activity. House hunting! Our time in Yellowstone will be over before the end of August so it's time to start preparing for life after Yellowstone. We got up around 5:00 so we could get to Pocatello in time to spend the day looking at rental houses. On our way out of the park we saw this beautiful sight of elk grazing in a meadow. Our time in Pocatello was a whirlwind of looking at houses, driving by more houses, and finally applying for the house we wanted. I ended up with probably the biggest headache of my life. But it was all worth it because a few days later we were notified that we'd got the house we wanted. I was glad that I could finally stop worrying about that. We stayed the night at a campground south of the city. We brought our little tent and we all remarked on how much we like tent camping. On our way back to Yellowstone we stopped at Mesa Falls. 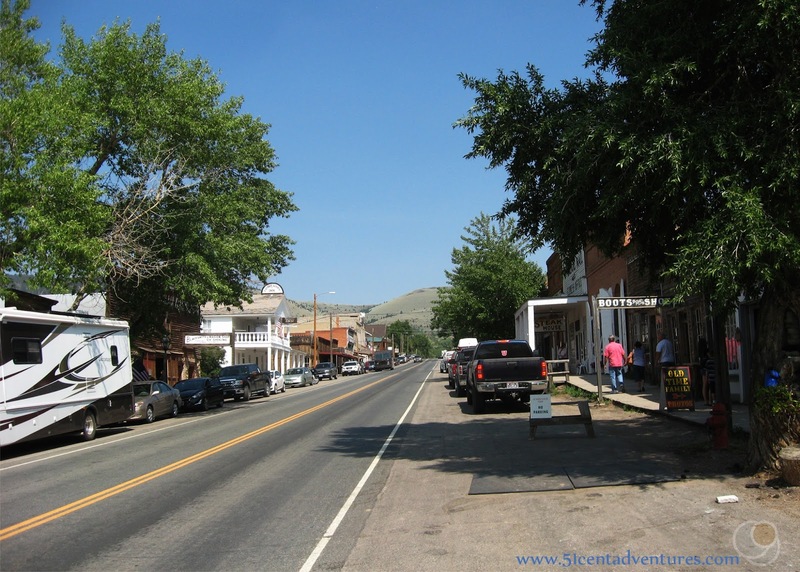 This is one of the first places I ever wrote about on this blog. My husband and I discovered this waterfall 9 years ago, but this is the first time we've been back together. (I stopped by with the kids almost exactly two years ago while he was at an Army training.) This is one of my favorite waterfalls and no visit to Yellowstone is complete without a stop here. We'd spent two days in Pocatello, but thanks to the magic of three day weekends I still had a day to play in the park before I had to go back to work. So we decided to pick up where we'd left off the week before and hike to Mystic Falls. And then we went to Old Faithful and hiked to the observation point so we could watch the eruption from up there. I've wanted to do this since I was 17. I was very happy with the view. And that pretty much gets us caught up to today. 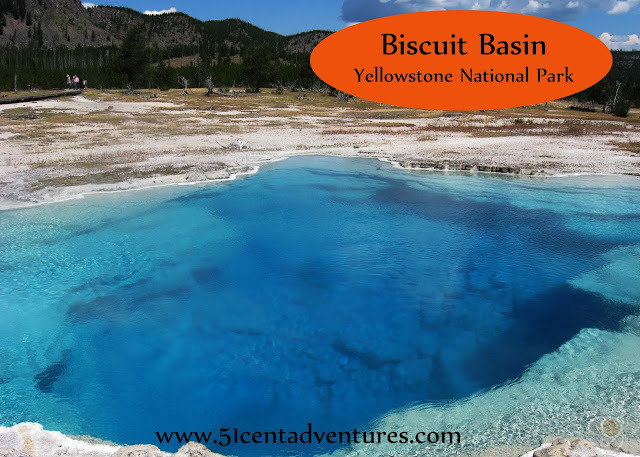 We have plans to see the Black Sands geyser basin and then swim in the Fire Hole River. I'm hoping to find time to post about those things soon, but no promises. The next three weeks are basically filled up with either things relating to work or things related to moving. But like I said, I plan to do some in-depth posts about the park in the weeks after we move. So keep checking back often.